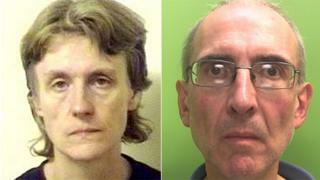 A husband and wife have both been jailed for life for murdering her parents and burying them in their back garden. Susan and Christopher Edwards were found guilty of shooting dead Patricia and William Wycherley and burying them at the Wycherleys' home in Mansfield, Nottinghamshire, in 1998. The bodies lay undiscovered until October last year. They were each given a minimum 25-year sentence at Nottingham Crown Court. The court heard the couple shot their victims at their home on the May Day Bank Holiday, then buried Mr and Mrs Wycherley in a metre-deep hole in their own back garden. Over the next 15 years, they stole a total of £245,000 from the Wycherleys by siphoning off their pensions, benefits and selling their home. A large amount of the stolen money was spent on Hollywood memorabilia, including autographs and photographs of movie star Gary Cooper and a £20,000 signed photograph of Frank Sinatra. The debt-ridden pair gave themselves up in France in October. Mrs Justice Thirlwall described the killings as "shocking crimes". She told them that, as far as they were concerned "only the two of you mattered". She told Susan Edwards, 56, who sat in the dock wearing a patterned grey cardigan and glasses, she was "an accomplished liar and a fantasist". "In May of 1998 the two of you planned to shoot and kill them in their own home and that is what you did," she said. "Mr Wycherley was 86, Mrs Wycherley was nearly 64," she said. "They were living a quiet, reclusive life in Mansfield. They knew no-one. They had as little contact as possible with other people. You knew they wouldn't be missed, if they disappeared and they weren't." The judge accepted "on balance" Edwards had told the truth about being sexually abused by Mr Wycherley as a child and that had formed the basis of the hatred she felt for her father. Susan Edwards's barrister David Howker QC described her abuse at her father's hands as "an ongoing feature" of her life "that created in her, some would say, the justifiable hatred of him and would be akin to a slow-burning, festering provocation that may explain in some way some part of why it happened". Mrs Justice Thirlwall suggested another motive for the killings - that Susan Edwards had felt she was owed money after she invested an inheritance into her parents' London home in 1979. She claimed she was later "emotionally blackmailed" into signing over full title of the house to her parents, who sold the property for profit without sharing the proceeds with their daughter. The judge added she believed Christopher Edwards, who had an interest in military history, "held the gun" and shot the pensioners - not Susan Edwards, as the couple claimed. Dafydd Enoch QC, representing Christopher Edwards, said: "They lived for each other and they retired into a world of autograph hunting - they are not ordinary folk." "He could not help but be drawn in and I don't mean that to shift the blame in any way to Mrs Edwards," he added. The judge said the facts of the case were "so serious and your culpability so high" she had no choice but impose minimum terms of 25 years each. Neither defendant appeared to react as they were jailed. Both denied murder but a jury unanimously found them guilty on Friday after a two-week trial. Speaking outside court, Det Ch Insp Rob Griffin of East Midlands Major Crime Unit said the couple were "emotionless" throughout the trial. He said the Wycherleys' family could see this "as an end". "It's been a long and tough journey for them from the minute we had to approach them to tell them their relatives were buried in the back garden for all that time to see several months on, the people who are responsible for that brought to justice, gives them some comfort." The current occupier of the house in Blenheim Close Sue Bramley has said, despite the bodies being found in her back garden, she and her teenage daughter were determined to stay in their "happy" home.